Realtime Gaming shows tribute to Ritchie Valens with their latest online pokie. However, not so long ago, Realtime Gaming launched an online pokie to show tribute to J.P. Richardson. The online pokie was named “The Big Bopper”, as it is the nickname of J.P. Richardson. J.P. Richardson was among the legendary trio of Rock ‘n Roll. However, the trio all died on the 3rd of February 1959 in a tragic plane crash. Since then, this day has been marked as the day music died. Now, Realtime Gaming has created an online pokie to show tribute to the second of the trio, Ritchie Valens. Realtime Gaming never ceases to excite its players. This is evident with their latest pokie online. 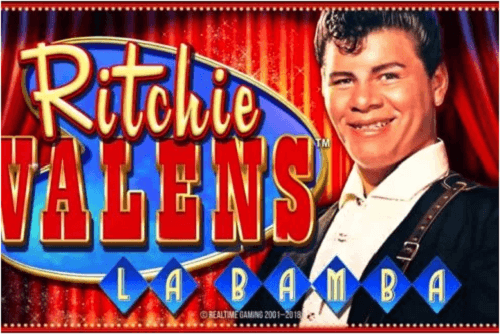 The pokie is named Ritchie Valens La Bamba, given the name after Mr Valens’ hit La Bamba. The video pokie casino game has already been launched on Australian online casinos such as Majestic Slots, Ace Pokies and FairGo casino. The wild symbol of the slot is Ritchie himself, but only appears on reels 3, 4 and 5. The wild doubles your payouts when it substitutes winning combinations. More so, the wild substitutes for the scatter symbols too but counts as only one symbol. The reels of the pokie are set in the background of 1950s bars, which is seen to be a recreation of a Rock ‘n Roll haunt, The Levee. Players are presented with three songs of Valens from ‘Come On Let’s Go’, ‘Donna’ and ‘We Belong Together’, which you can play while the reels are spinning. The scatter symbol is in the form of the La Bamba record, if you receive three of these, you’ll get paid an amount which is equal to your bet amount. The free spins feature is activated when you get four or more scatters, which can be aligned either from the left to right or visa-versa. The line payout symbols include a guitar, a Ritchie button, Valens on TV, phonograph, tickets, speaker, autograph book and shoes. You are awarded for line payouts for combining three or more symbols. The pokie has a numerous amount of ways for you to make tons of extra cash. For example, if you activate four scatters, you will be rewarded with 20 free spins. A randomly assigned payout multiplier will be activated by every free spin which could be 1x, 2x, 3x. So, be sure to check out the new online pokie and increase your bankroll with Ritchie Valens and Realtime Gaming.